Summer is upon us and it is time to plant our gardens! If you are short on space, try container gardening on your porch, patio or windowsill. You can even look for a community garden in your neighborhood. Here’s a tasty tip: Try adding fresh herbs to your favorite recipes instead of salt. A note on phosphorus: All fruits have about 40 mg phosphorus per ½ cup, and most vegetables fall into the range of 15-60 mg phosphorus per ½ cup. 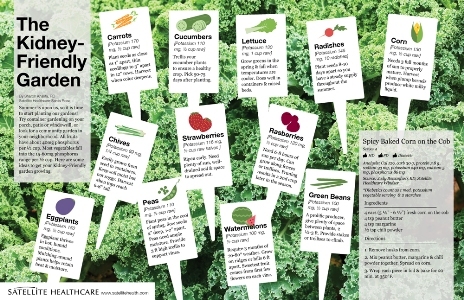 Check out these ideas to get your low-potassium Kidney-Friendly garden growing. 1. Remove husks from corn. 2. Mix peanut butter, margarine and chili powder together. Spread on corn. 3. Wrap each piece in foil and bake for 20 minutes at 350F. Sign up for our monthly newsletter for up-to-date info on everything about home dialysis. Home Dialysis Central is made possible through the generous annual contributions of our Corporate Sponsors.